It feels really good to be doing an outfit post, I haven't done one in ages and I'm pleased with how my pictures turned out which is very unusual. I'm still getting used to all the settings on my new(ish) camera. I only have a week left at Uni till Christmas and I'm so excited, but I should probably be thinking about getting an assignment done which is in for Friday, doh! 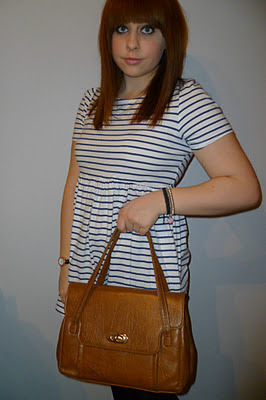 My outfit for today's post is quite simple but sometimes simple is good right? After mentioning it in my last post, I actually went and bought my first MAC product and got the Pink Plaid lipstick and I'm so happy I did, I've been wearing it nearly every day since (and you can see it). You will also get to see my new handbag which I got from a charity shop for £4 which I think is amazing! I'm a bit obsessed with bags, it's 'my thing' and when I was little everyone used to call me The Bag Lady, oh yes. 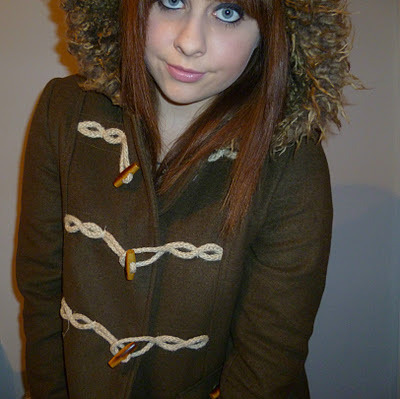 The coat I am wearing is actually from Primark and I got it in their sale for £10 which is also pretty good. I wore my Missguided cardi with the dress when I went out in the cold. I just wanted to add that I apoligise for being slow with replying to comments on my blog but I can't do it on my laptop so I have to do it on my phone which is more awkward but I read all my comments and really appreciate them so thank you. Who's excited for Christmas, cause I am!? Love the dress and that bag is a great bargain! I'm also currently wearing that Barry M Nail Paint in Rasberry! With the gold foil effects too. Yes it's such a great colour isn't it! Cute dress! I also adore your bag..! Love that it's from a charity shop too!